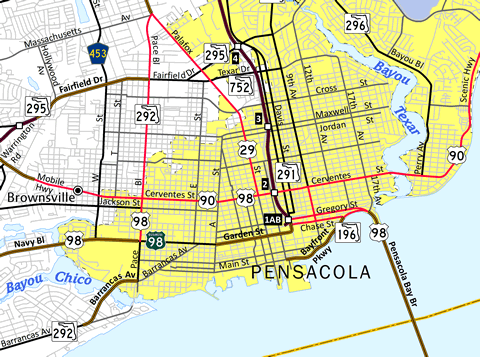 SR 30 follows U.S. 90 Business through downtown Pensacola as U.S. 98 utilizes a bypass route following Pace Boulevard (SR 292), Cervantes Street (U.S. 90) and Ninth Avenue (SR 289). A well-signed business loop through Downtown Panama City, Springfield, and Parker. U.S. 98 Business carries the hidden designation of SR 30, as SR 30A follows the four lane arterial bypass of U.S. 98 around central Panama City.